If you aren’t aware, Thimbles retail store has closed. I will continue to send out blogs and if you are not interested in continuing to receive, please unsubscribe. If you are unable to do so, please send me an e-mail and I’ll make sure that is taken care of. For those of you that wish to continue to receive and see what’s going on, just sit back and enjoy! The website is currently being updated. 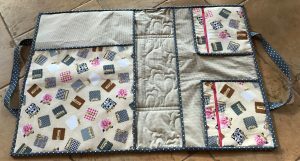 If you are interested in the pattern, let me know and I’ll send to you. It’s a great organizational bag to fit your mat, long & wide rulers, small items and the all important seam ripper, scissors, etc. Folds and lays flat. Sewing Machine Repair: Don’t worry, still offering sewing machine repair. Drop off and pick up point at Spooner Mercantile which is the east side of Walnut street on the corner. When the weather improves, take your machine in through the back door. You will see a small table “Norm’s repair”. Fill out the repair form. Please include information if it needs a cleaning or if there is something not working. It generally takes a week unless parts are needed. Northwind Book and Fiber in Spooner purchased the inventory of Cosmo Embroidery Floss so you will still be able to purchase in Spooner. 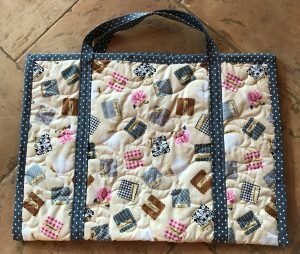 Just a sneak peak at the March bag…..It’s a small duffle bag from the book “Duffle Bags” by Cindy Taylor Oates. The book retails for $14.99 and has two styles and three sizes. May just end up making all three sizes. Looks like it’s going to be a great weekend to sew as the snow is on it’s way. Unless you’re on your way to the “Birkie” in Hayward. Enjoy your week and keep sewing.